Penn State Health Milton S. Hershey Medical Center completed the first major step in becoming a latex-free health care facility. Effective December 2017, all disposable gloves used by surgical and support staff became latex-free, which substantially reduces the risk of allergic reactions for patients and staff. The surgical glove conversion marked the first step in a three-stage initiative being led by a cross-disciplinary team, including Dr. Dorothy Rocourt, assistant professor of surgery and pediatrics at Penn State College of Medicine; Kathleen Law, vice president of nursing, perioperative services at the Milton S. Hershey Medical Center; and Crystal Rodriguez, value analysis facilitator at Penn State Health. Natural rubber latex, a derivative harvested from rubber trees in Malaysia, is a common component in medical supplies. Repeated human exposure to proteins within the latex may trigger mild to severe allergic reactions that can include skin rashes, itching, hives, nasal congestion, breathing difficulty or respiratory arrest. Health care workers and certain patient groups are at increased risk due to repeated latex exposure. An estimated 8 to 12 percent of health care workers are latex sensitive. Nearly 73 percent of children with spina bifida and adults with conditions requiring multiple surgeries are also considered high-risk groups for experiencing latex-based allergies. “In terms of patient and staff safety, this latex-free initiative is well worth the effort,” said Rocourt, physician-advocate for the project. 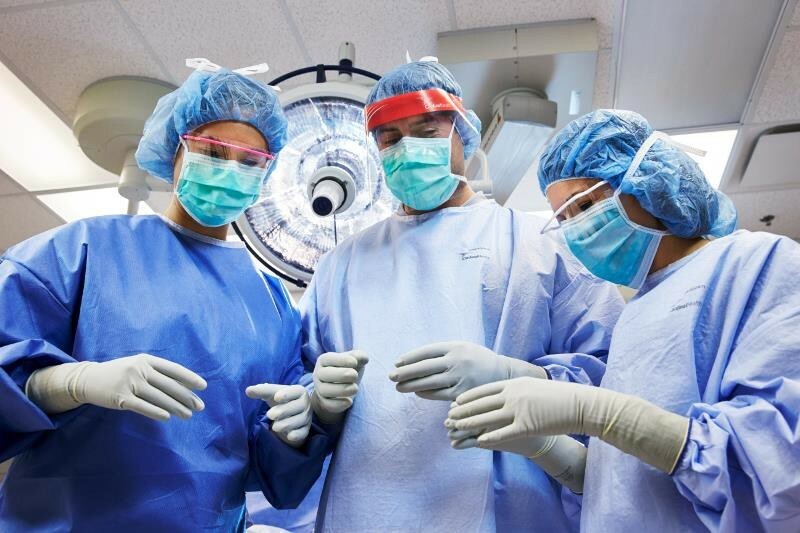 In October 2017, Cardinal Health, the Hershey Medical Center’s primary surgical glove supplier, staffed a two-week surgeon glove fitting and evaluation for medical and surgical staff members. Rodriguez said that of the hospital’s 800 clinicians who wear surgical gloves, 508 staff members participated in the event, which exceeded the project goal. The project’s second phase, which began in March, is the systemwide conversion of nearly 200 urinary products, including Foley and standard catheters. The final phase will be to identify and replace specialized items within departments for latex-free alternatives. The goal for project completion is December 2018.